Nina and Vanessa stopped by Despierta America in Miami, Florida today to promote Dog Days together which opens up August 8th! They of course discussed the movie, and how they did not work together on the movie but they did shoot the Cosmopolitan cover together, and how they do share mutual friends. They also discussed their dogs along with other things you can watch the videos below, enjoy! I’ve also added photos from Nina’s appearance to the gallery so be sure to check those out she looked amazing. Check out Nina as Elizabeth in Dog Days below, which now has been moved from August 10th to August 8th so be sure to check the movie out when it is released! After a ruff relationship, Elizabeth’s love life was on paws. Don’t miss @nina in #DogDays, in theaters August 8. Adopt Love Shirt inspired by Dog Days the film! 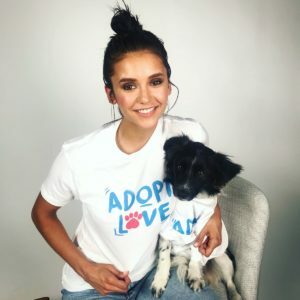 Nina shared on her Social Media an adorable shirt Adopt Love inspired by her new Movie Dog Days which will be out August 10th and we can’t wait. If you are interested you can purchase the shirt at Omaze get them before they sell out and it’s for a great cause as well. Dog Days Twitter page released a Brand New Dog Days Poster promoting the movie, which will be released August 10th in theaters. 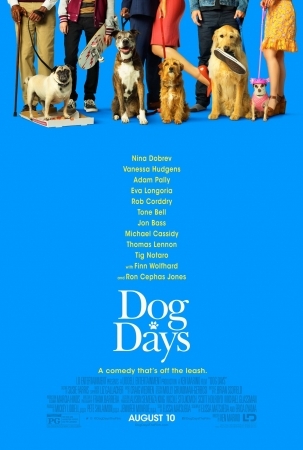 Dog Days Official Trailer has been released which is now the second Trailer for the movie. Be sure to mark those calendars for August 10th when it hit’s theaters! I’ve added captures to the gallery from the trailer so give those a look, and you can also check out the previous captures from Trailer #1 along with Production Stills and Movie Posters if you haven’t seen those yet. Nina Dobrev & Vanessa Hudgens Secret Cover Shoot! Today Nina and her Dog Days Co-Star Vanessa Hudgens did a Cover Shoot which we have no idea what magazine it is for, all we know is that it is released in 2 months and we can’t wait, after all the behind the scenes we got today on instagram! We can assume it is of course to promote Dog Days because Nina and Vanessa both participated in the photo shoot so that of course is a pretty safe assumption right there but as far as what Magazine that is unknown, keep checking back for details we will post as soon as we know more. 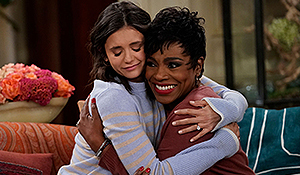 I have added captures of Nina from the Dog Days Trailer in the gallery along with that I also added one Production Still and Movie Posters as well so check those out. Who’s excited for Dog Days?